Documentation is critical for accurate electronic health records. 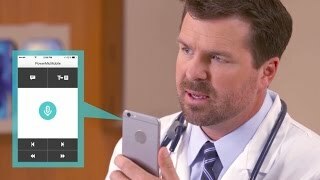 Nuance makes it easy for clinicians to dictate, edit, and navigate the EPR simply by speaking—via a secure mobile app or wired microphone. Now clinicians can use PowerMic Mobile on their own smartphone, PowerMic at their workstation, or other supported handheld or headset microphones with Dragon Medical solutions to dictate the patient story directly into the EPR. Move from room to room, workstation to workstation, using your own personal smartphone as a convenient, wireless mic. Provides greater flexibility to fit caregivers’ schedules while extending clinical documentation capture. Ideal for dedicated Dragon Medical dictation workstations. Combines a robust, ergonomic USB microphone with full-function, PC-mouse capabilities to avoid constant switching from microphone to mouse to keyboard. PowerMic Mobile and PowerMic are complementary solutions that allow IT to deliver the ease of accuracy of Dragon Medical speech recognition to every clinician, across physical and virtual environments. They work seamlessly with Nuance Healthcare solutions. PowerMic Mobile grows with your organisation, offering web-based central controls for configuring and managing user accounts and preferences. With support for virtualised EPRs, PowerMic Mobile offers greater clinician mobility throughout the hospital, in clinics, at the office and at home. PowerMic Mobile enhances clinician productivity and convenience with support for virtualised EPR deployments and 256-bit encryption with end-to-end security over WiFi or cellular networks. PowerMic Mobile is an iPhone and Android app that lets clinicians use their own smartphone as a dictation microphone at any workstation with Dragon Medical. It’s easy to use and pairs instantly and securely. There’s no hunting for a dedicated USB-microphone, so clinicians can spend more time with patients, capture notes while information is fresh, or catch up on clinical documentation from home. During our pilot, PowerMic Mobile increased clinician mobility throughout the day and let our physicians complete their patient notes on any available hospital workstation as soon as they meet with each patient, without the need to find an open, dedicated dictation station. PowerMic Mobile has created a lot of enthusiasm around mobility and technology and, therefore, Dragon Medical and physician documentation. Find out how PowerMic Mobile and PowerMic makes dictating directly into the EPR easier than ever.